Part of the kitchen and breakfast area is shown above. This home flooded and the floors and walls needed to be replaced, and/or repaired. The kitchen wallpaper was the homeowner’s favorite and she really wanted to find the same thing to replace it. Unfortunately it was no longer made, but she did have enough left over from the original job to replace the main area of the kitchen, just not enough for the breakfast room. About 12 inches of wall was removed all around the home. It was quite a bit of work to remove what was left of the old papers on the now dry sheetrock. I also stripped the paper from all the walls in two bathrooms, primed, then faux plastered and painted those rooms as well. Did I tell you I was her original paperhanger which was 12 years prior? It was just a coincidence that she found me, but BOTH of us were very glad to see each other again. Then, after stripping paper and applying a wash. The paper was used to make a border around the top because the homeowner wanted to preserve a bit of it. Same original wallpaper as the 1st bathroom. 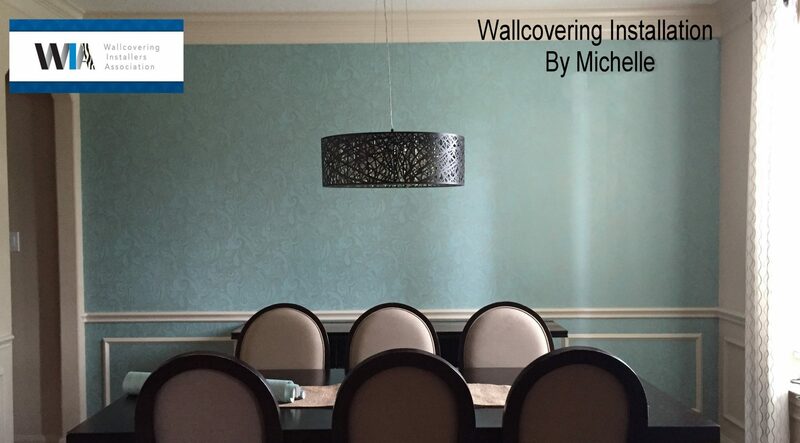 This entry was posted in Kitchen, Textured walls, Wall Finishes, Wallpapering Jobs and tagged Cypress Texas paperhanger, faux plaster, Houston paperhanger, Houston wallpaper hanger, lady paperhanger, paper hanger, Wallcovering Installation by Michelle, Wallcovering Installers Houston, wallpaper hanger, Wallpaper hanger in Houston, wallpaper lady Houston Texas on September 22, 2016 by Paperhanger. I loved this paper so much I may hang it in a room in my own home. The dark paper was the original paper. Although there was some prep work, I did not have to worry about much of it because the homeowner removed all the existing paper and took down the lights and other things from the walls. He did an amazing job, I must add. I then repaired some areas and primed the walls. The paper went up beautifully although my photos do not capture the finished look as well as I had wished. This entry was posted in Bathrooms, Wallpapering Jobs and tagged Bath remodel, Cypress Texas paperhanger, Hall Bath updated, Houston paperhanger, Houston wallpaper hanger, lady paperhanger, paperhanger, Paperhanger in Cypress Texas, Wallcovering Installation by Michelle, Wallcovering Installers Houston, wallpaper hanger, Wallpaper hanger in Houston, Wallpaper lady on December 4, 2015 by Paperhanger.